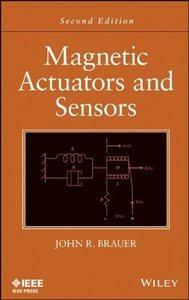 John R. Brauer, "Magnetic Actuators and Sensors, 2nd Edition"
The Second Edition of this must-have book for today's engineers includes the latest updates and advances in the field of magnetic actuators and sensors. Magnetic Actuators and Sensors emphasizes computer-aided design techniques—especially magnetic finite element analysis; offers many new sections on topics ranging from magnetic separators to spin valve sensors; and features numerous worked calculations, illustrations, and real-life applications. With access to a support website containing downloadable software data files (including MATLAB® data files) for verifying design techniques and analytical methods, Magnetic Actuators and Sensors, Second Edition is an exemplary learning tool for practicing engineers and engineering students involved in the design and application of magnetic actuators and sensors.